The events will occur during the 16 Days of Activism Against Gender-Based Violence Campaign (16 Days Campaign), a global advocacy campaign coordinated by the Center for Women’s Global Leadership, within the theme “From Peace in the Home to Peace in the World: Let’s Challenge Militarism and End Violence Against Women.” The 16 Days Campaign runs annually from November 25th (International Day for the Elimination of Violence Against Women) through December 10th (International Human Rights Day), making the link between gender-based violence and human rights. As multi-media, multi-space events that directly link to the theme of the 16 Days Campaign, “From Asia-Pacific to the Americas” will be a mobilizing effort for activists and academics to strengthen and link local and global work to address gender-based violence. The multiple events provide a forum for dialogue and strategy-sharing, and demonstrate the solidarity of activists, scholars, and communities around the world. Our events include: Film Screening, International Webinar, International Symposium, and Digital Display. 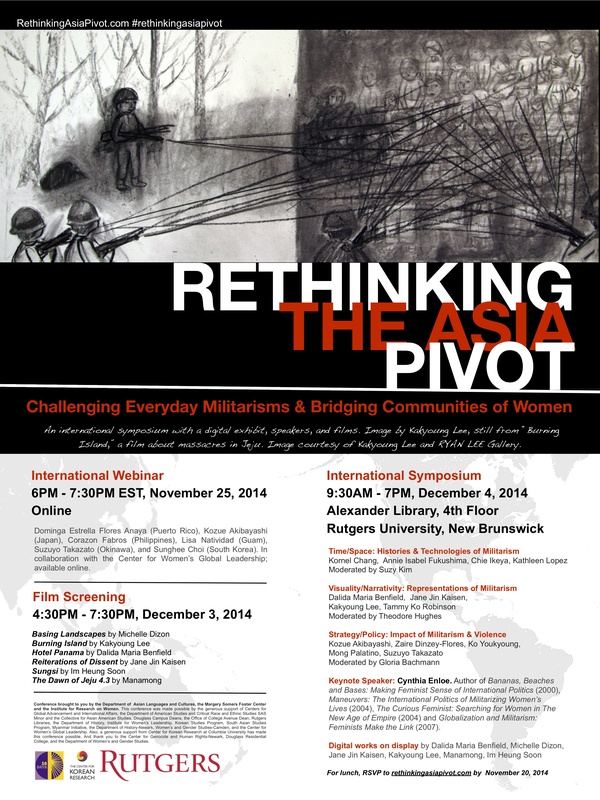 The events invite a dynamic group of scholars, activists, and artists who work on: peace, the environment, anti-violence, policy change, and research and teaching on issues of gender, militarisms, Asia-Pacific and the Americas. The goal of the events are to benefit Rutgers University, alumni, and the New Jersey community through activities that bring together faculty/staff, students, and alumni across the three campuses, as well as Rutgers Biomedical Health Sciences.